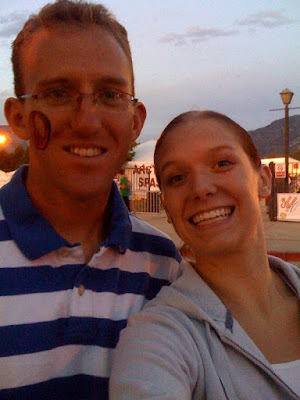 Last Friday night Shad and I trekked on over to the Weber County Fair grounds for the Weber County Fair. Who doesn't love a good fair? Animals, terrible cover bands and fried food. I know of no other place you can compete in such exciting areas as table settings and terrifying looking dolls. Here are a bunch of pictures from our fair experience. 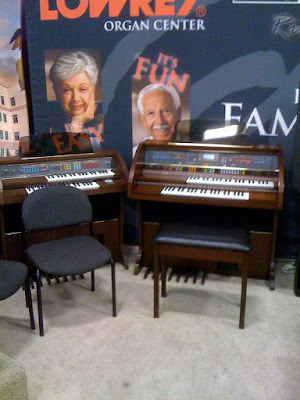 We Considered picking up a new organ in the vendor building, because organs are fun, the display says so. I think I might suggest these to my company for cost savings. 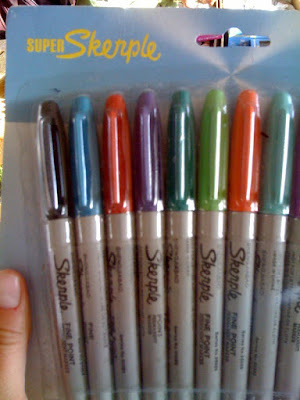 Forget Sharpies - Skerples are all the rage! 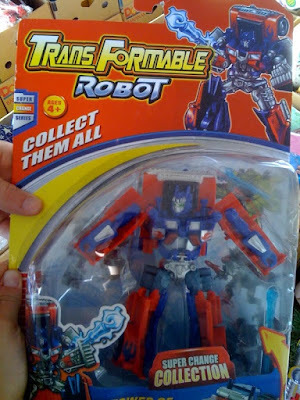 And how could we go home with out a transformable robot? He looks like someone very familiar. 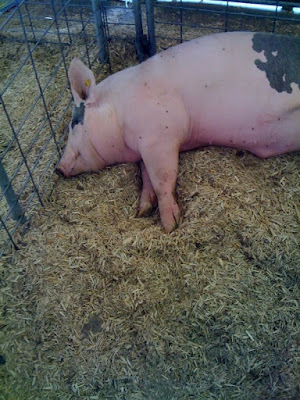 We then braved the animal areas, we saw some really fat lazy pigs. We found one that was awake. 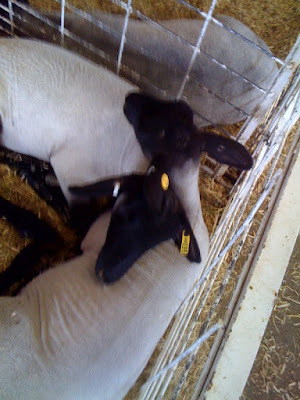 There were some adorable sheep - Shad still won't let me get one! I keep on telling him Dublin likes sheep but he thinks otherwise. Plus he keeps on telling me they're stupid animals and will get into trouble. I made sure he didn't say those things around the sheep - their feelings would have been hurt. We paid 50 cents to get our faces painted. Thanks Weber County Library. This is why you should pay more than 50 cents for face painting. This lightening bolt was no where near this obese in the example. Lastly I think the fair confirmed Dublin's previous goat existence. 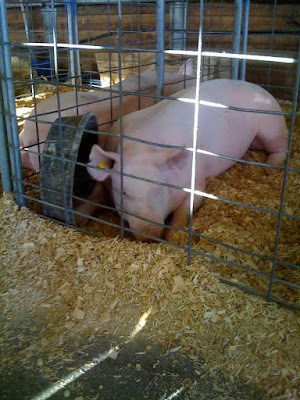 When we visited the petting area which animals were shoving their heads through the cages and stealing food to get attention? Sheep is the wrong answer, it wasn't the really obese cow either. You guessed it, the goats. They loved new people especially children just as much as our dog does. He will stop at nothing to get their attention! Oh yeah, we did come home with a new friend for Dublin. His name is Zeke, short for Ezekiel. He's a Dwarf African Frog. I showed him to Dublin when we came home and he tried to eat him. I say new friend, and he thinks I wonder if he tastes good. Zeke lives on the kitchen counter now, safe from Dublin's reach. PS - The other day Dublin caught a grasshopper and I had to rescue it from his mouth. I saw him chasing something in the grass then suddenly he just stopped and sat down. I went over and opened his mouth and sure enough, there was a little green grasshopper sitting on his tongue. Lucky for the grasshopper our dog doesn't believe in chewing things he eats, he hopped out and went on his merry way. I guess since he can't catch birds, grasshoppers are the next best thing. I love the fair! I look forward to going every year. I cant wait for the Utah State Fair. Its the best. I like the obese lightning bolt, it shows diversity. Also, very jealous of the frog. Love frogs. Oh my goodness! What a lovely time! I love a good fair! And I look forward to meeting Zeke! 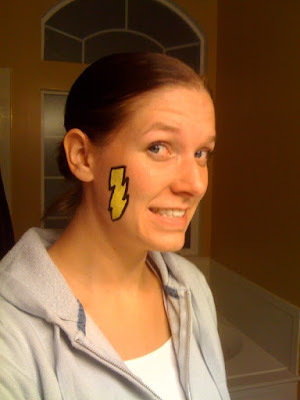 I'm pretty sure my fav part is the chubby lightning bolt on your cheek! HI-LARIOUS!